Jaume Padilla is Assistant Professor of the Department of Nutrition and Exercise Physiology of the University of Missouri. The mission of the Department of Nutrition and Exercise Physiology at the University of Missouri is to improve the health of Missourians and the larger population through research, teaching and outreach related to nutrition and physical activity. The University of Missouri is one of only 34 public universities in United States, and the only public institution in Missouri, to be selected for membership in the Association of American Universities. 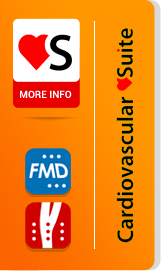 Cardiovascular Suite (QUIPU) is the devices chosen by the Dr. Padilla for his studies. Dr. Padilla’s research is primarily focused on understanding the physiological and molecular mechanisms by which physical inactivity and obesity-associated insulin resistance leads to impaired vascular function. His research is integrative and incorporates in vitro endothelial cell and whole-vessel culture models, in vivo metabolic and cardiovascular studies in small and large animals, and translational vascular studies using human subjects. To conduct this work, Dr. Padilla has a wet lab space and a human cardiovascular function laboratory, all of which are equipped with cutting edge instrumentation. The work of Dr. Padilla is currently supported by the National Institute of Health and other internal funding sources from the University of Missouri. 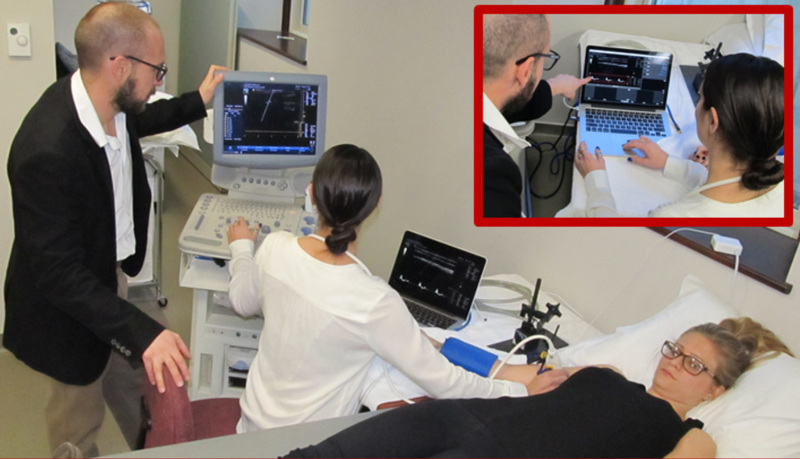 of blood velocity and arterial diameter via high resolution Doppler ultrasound together with the use of specialized automated arterial wall-tracking software. According to Dr. Padilla, Cardiovascular Suite (QUIPU) offers an excellent package for wall-tracking analysis in FMD studies. In his opinion, this program is very user friendly allowing students to become trained and proficient more rapidly than when using other programs that are commercially available. 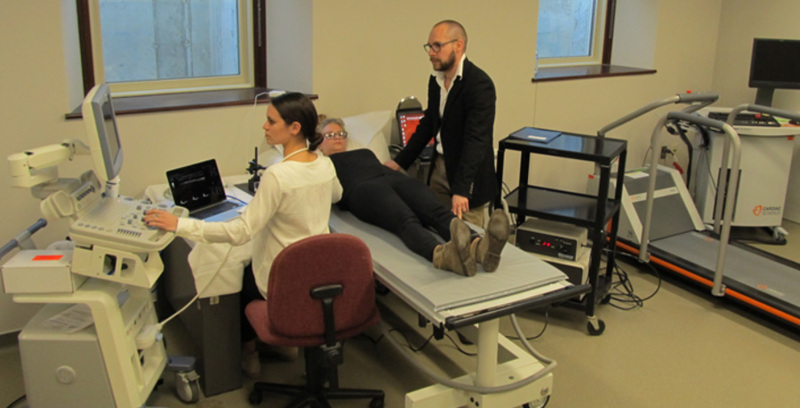 As illustrated in these images, graduate student Lauren Walsh, under the guidance of her mentor Dr. Padilla, is performing an FMD study using the Cardiovascular Suite software.